Yesterday we met debut author, Liz Johnson, who has a Love Inspired Suspense novel just hitting the shelves. She's also giving away a copy here at Patterings, so be sure to leave a comment on this post or yesterday's, with your email addy so I can track you down if you're the winner. The book drawing is open until Saturday evening when I'll let my favorite random number generator pick the winner. I'll announce the winner on Sunday. Liz, welcome to Patterings! Tell us a little about yourself. I am a child of God and always loved by Him. I am a daughter, sister, and aunt to the most wonderful family in the world. I am a full-time publicist, a sometimes writer (not nearly as regularly as I should), and an even less frequent jogger. I live in Colorado Springs, Colorado, and I enjoy theater, ice skating, volunteering in my church's bookstore, and making frequent trips to Arizona to dote on my nephew and three nieces. I’m a sucker for stories of true love with happy endings. 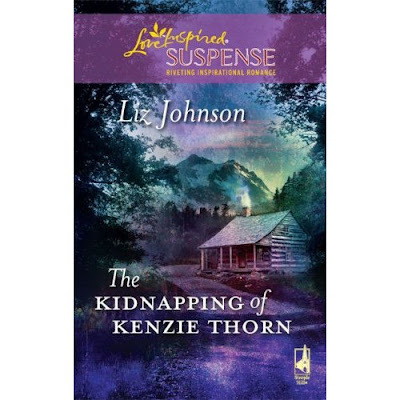 The Kidnapping of Kenzie Thorn is my first novel, and I blog about my adventures (and often misadventures) in writing at www.lizjohnsonbooks.com. What did you do to celebrate your first book being published? Oh, definitely Kenzie! She really cracks me up. She’s forever putting her foot in her mouth and reacting on emotions, then realizing she’s made a mistake. I love her reaction when she asks Myles if the mountain lion they’re staring down won’t attack if they’re really quiet. He looks at her and says, “Well, we’re not being very quiet, are we?” Her shock is so genuine, and still makes me giggle. I think it was less of a specific discovery than it was a process of figuring out what was really on my heart. I’ve been writing short stories and novels (a term I use very loosely in this case) since I was 7. It’s always been a part of my life. But I don’t think I realized how much I wanted to be a published author until after college. Before that I was just playing around. When I started getting serious about my writing and took classes to hone my skills, I discovered that the story ideas just kept coming. And I’m thankful they haven’t stopped. I’d like to claim the title of Most Undisciplined Published Author. I hear author friends and role models talking about how they write every day and usually get a few thousand words written each session. Not me. I definitely go in spurts, and I really struggle to set aside time to write—especially with a hectic day-job. One thing that really helped in getting The Kidnapping of Kenzie Thorn written was an accountability buddy. Every morning at work, my fellow publicist Kelly Blewett would ask how much I’d written the night before. Knowing I had to ‘fess up to her gave me the motivation I needed to get from the dreaming to the writing stage—and it earned her a spot on my dedication page and her dog Henry a role in the book. The only other thing I’ve found to really help is having a writing buddy. One of my friends is an editor, and we get together every Monday night to write for an hour. (On nights that Castle is on TV, we always finish on time and watch our favorite mystery writer solve a crime with his detective muse.) Lately we’ve also been putting our lunch hours to better use. When I told my mom about 2 years ago that I was going to start writing with Jess, she laughed at me. She thought we’d spend the whole time chatting. Sometimes we do. :) But not always. In fact, we went to Estes Park, Colorado, last March on a writing retreat. We rented a cabin, set up a schedule, and both wrote well over 10,000 words, finishing our works in progress. I figure I’m sedentary enough when I’m writing, I don’t need to be snacking, although peanut butter m&m’s somehow always make me a happier writer. But I’m generally pretty thirsty, so I keep the diet dr. pepper flowing. It’s quite the wonderful caffeine kick when my plot needs a jolt. Until recently I didn’t realize how varied my reading habits really are. I was ordering an old book online, and my roommate commented that I like a lot of different types of books, which is so true. I love Christian fiction and read a ton of it! Of course, I work in the publishing industry, so I get to read a lot of books for my day job. Some of my favorite Christian authors are Cindy Woodsmall, Tamara Leigh (Splitting Harriet is one of my all time faves! ), and Gilbert Morris’s The Appomattox Saga. I definitely try not to limit my reading to only authors that I know and love. There’s just never enough time to read all the books that I want to. In the mainstream arena, I’ll pick up anything by Meg Cabot—I love her YA books! And while I am trying to read more classics from authors like L.M. Montgomery, Jane Austen, and Louisa May Alcott, my nightstand is currently playing host to two other Steeple Hill authors Betsy St. Amant and Camy Tang, The Death and Life of Gabriel Phillips by Stephen Baldwin, and my all-time favorite, The Witch of Blackbird Pond by Elizabeth George Speare. I keep mentioning it in interviews, and it reminded me how much I love it, so I pulled it out for a re-read. My second favorite book ever is The Princess Bride by William Goldman. If you’ve never picked it up, you’re missing out. Hugely entertaining, and snort-inducing hilarious. And that’s just on the fiction-front. I read lots of nonfiction by authors like Mark Batterson, Max Lucado, and more. In general, I think the Lord is trying to teach me contentment with where He’s placed me in all areas of my life. But I’m not always a great student. :) He’s busy working on getting my heart in just the right place so that I find daily joy in Him, not my circumstances. We’ll just have to see how that ends up in a future book. His lessons in my life always do find their way into my writing. No contest. Prince Edward Island with a little trip over to Halifax, Nova Scotia to see the maritime museum with the Titanic exhibit. I’m a huge Anne of Green Gables fan, and I can’t wait to see Anne’s land. I made a promise to my mom years ago. I can’t even remember when I first brought it up … maybe as early as high school. I told her when I sold my first book, I’d take her on a trip to PEI. Well, here I am one contract later, and I’ve discovered there isn’t quite as much money in being published as I once thought. So I amended my promise. Told Mom I’d take her after the next book. I can’t wait to ride bikes on the beach, see the rolling green hills, and imagine where Anne and Gil were the first time they realized they were in love. I don’t know about the quirkiest … hmm … I’m pretty strange all the way around. I will say that several months ago I borrowed the Phantom of the Opera soundtrack from the library, downloaded it to my ipod and spent weeks singing along to it. At home. At work. At the gym. I’ll just say that I started getting really strange looks while I was on the elliptical. I can’t believe there are people out there who don’t like “Past the Point of no Return” being sung very badly! And even after public humiliation, I blogged about it at www.lizjohnsonbooks.com. Apparently I have a high tolerance for being mocked. I definitely would love to win this book. Please enter me. Love suspense. Thank you. Thanks so much for having me! It was such a pleasure! I would love to win The Kidnapping of Kenzie Thorn! Thanks for entering me in the drawing! I think the motto around this house is that we can never have too many books. Congratulations, Liz. Love hearing new author stories. I wish you continued success. And you are a fellow Coloradoan. I think 80 percent of all Colorado folks are transplants like us. Thanks for the great interview! Hope you both have a great holiday weekend!